What do you earn in the Army? Post-traumatic stress disorder has been known as a few things over the years: cowardice, battle fatigue, nostalgia, soldier’s heart, shell shock. References to the effects of trauma go back as far as Homer’s Iliad, and writers such as William Shakespeare and Charles Dickens wrote about what we now recognise as PTSD. For a long time it was not properly understood or accepted as a medical condition. Opinions varied as to the reasons people suffered so badly after abuse, attack, or terrifying events. As is typical of our more unenlightened descendants, sufferers were usually accused of being weak minded or unmanly. It wasn’t until the mid-19th century that attempts to quantify and correlate the effects of combat on troops were made. The expansion of literacy during this century meant that many soldiers who went to war could write about their experiences. The American Civil War and the Franco-Prussian War are two of the first conflicts in which accounts, diaries and novels were written for, and read by, the general public. As science expanded, evolved and became more popularly understood, so to did the vocabulary used to describe mental conditions. This combination of literacy and vocabulary meant that those who had experienced combat (and railroad crashes) could express themselves in a way that was more readily understood. People started noticing the corroboration and correlation of the effects of combat: sleep problems, violent urges, flashbacks, sadness and depression, anxiety. Initially, these were ascribed to a physical condition, blaming a damaged heart or an overstimulated nervous system. Drugs have been used for millennia by soldiers to cope with the anticipation and aftermath of combat, but for the first time they were prescribed by a doctor who recognised they had a condition. “Da Costa’s Syndrome” was the common term for PTSD in the American Civil War, and while it was wide of the mark in terms of its causes in the body, it was the first real step in the road to discovering and treating PTSD. The First World War, or the Great War as it was then known, saw unprecedented numbers of young men exposed to the horrors of combat. 10 million people were killed, mostly soldiers, and scores of millions more injured. The terms for PTSD at this time were “shell shock” or “war neuroses”. World War I was the first conflict in which vast numbers of shells had been used, and shell shock is so called because it was thought to be caused by the repeated explosions a soldier was exposed to damaging the brain. Huge numbers of young men suffered from this debilitating condition and for the first time, many different treatments were attempted for a large number of patients. Rehabilitation included hydrotherapy, electrotherapy, hypnosis and drugs, alongside reintegration into normal routines. Some soldiers were accused of cowardice or dereliction of duty due to their PTSD and imprisoned or shot. The greatest conflict of all time created the greatest number of people suffering “battle fatigue” or “combat stress reaction”. There was greater acceptance of the condition, though many generals did not believe it was a real condition. One estimate of military discharges during WWII was that 50% were due to what we would now term PTSD. An established method of diagnosing and treating CSR was developed and soldiers who were not completely fit would not be allowed to return to duty. The third Diagnostics and Statistics Manual (DSM III 1980) finally added PTSD as a recognisable condition, having struggled to find an adequate description before. Holocaust survivors, Vietnam and Korea veterans, the survivors of childhood abuse had commonalities between their experiences that pointed to a diagnosable condition as a result of trauma. 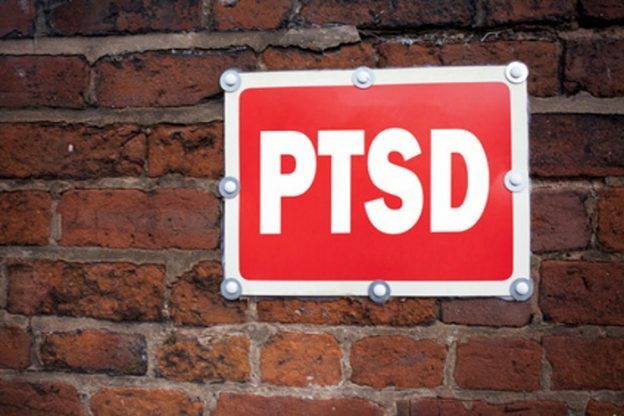 Until recently, PTSD had been treated and compensated for by charities and medical foundations like the NHS. The Military declined responsibility for the mental conditions caused by active service when they treated and compensated most physical injuries. Experts regularly criticise the Army for not providing enough care for veterans suffering from PTSD, though the numbers of successful claims for compensation for mental disorders have risen, it is only the “tip of the iceberg”, according to some veterans. “Non-visible” injuries are still not considered as serious as the more immediately visible wounds that can occur on a battlefield. Campaigns to change this are gaining momentum but face intense opposition from the MOD, largely due to the predicted costs of compensating the many sufferers. PTSD is a physical condition: it is a result of trauma to the brain, which is a delicate physical organ like any other. As understanding of PTSD increases, it is understood that it is a common condition, suffered by almost 1 in 25 people at some point. Most people do get better and lead normal lives, and with new and effective treatments like EMDR and CBT, survival rates and quality of life measures are improving. Most soldiers never received a diagnosis in the past, now there is thorough screening for symptoms during and on leaving the service. Attempts are being made at making reintegration into society much smoother, with “half-way houses” for veterans helping to bridge the gap between the Army and society. This reduces the impact of PTSD in studies, and hopefully will be rolled out nationwide. This entry was posted in Army Life on March 8, 2018 by robert77. Can I claim compensation if I am injured in the army?